What do you get from a side of beef? You can choose from a variety of cutting options. 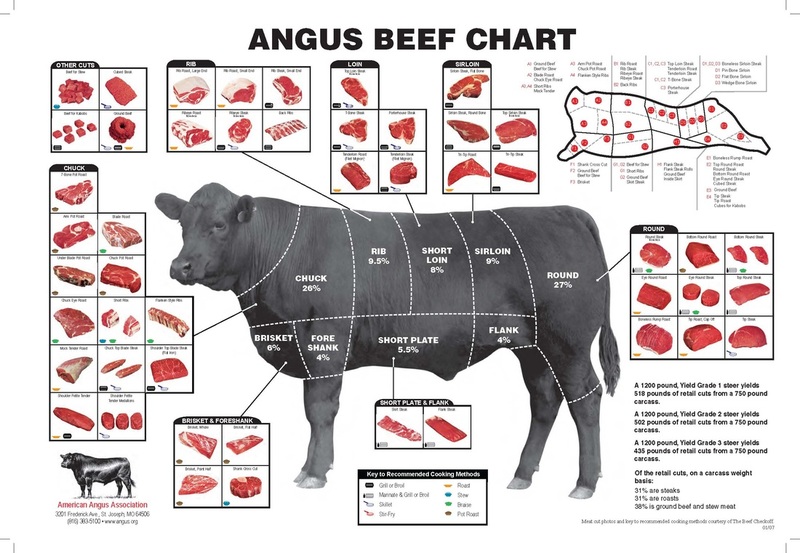 Your beef will be processed according to your own personal, specific processing instructions. Steaks can be cut thick, medium, or thin. You can even choose how many steaks to put in each package. Roasts will be cut according to the weight that you specify (i.e. 2-3 lbs., 3-4 lbs, etc.) Steak options are Filet Mignon, Porterhouse, N.Y. Strip, T-bone, Ribeye, and Sirloin. Ground beef can be packaged in 1lb, 1.5lb or 2 lb packages. Other options are cubed steaks, short ribs, boneless stew meat, and patties. Our preferred processor is Weltin’s Meat Packers, located in picturesque downtown Minden City. Located in Michigan’s Thumb Region, Weltin’s is a USDA inspected facility – the only local facility which accommodates our 3-week hang time for perfectly dry-aged beef. However, should you purchase your entire steer from us, and have an alternate preferred processor, we will gladly deliver to your choice of processing facility within 60 miles of our farm.